The letter applied for is thought to have been sent to warn the House of Commons of possible vile criminal activities involving Keith Vaz and that they were being investigated by the police. These allegations and the conflict of interest by Vaz (being investigated for criminal activities whilst on a powerful Justice Committee) it seems were not passed on by Bercow to anyone. This enabled Vaz, having resigned, from the Home Office Public Affairs Committee to swiftly join the Justice Committee. (To be clear, this is fact not irony). 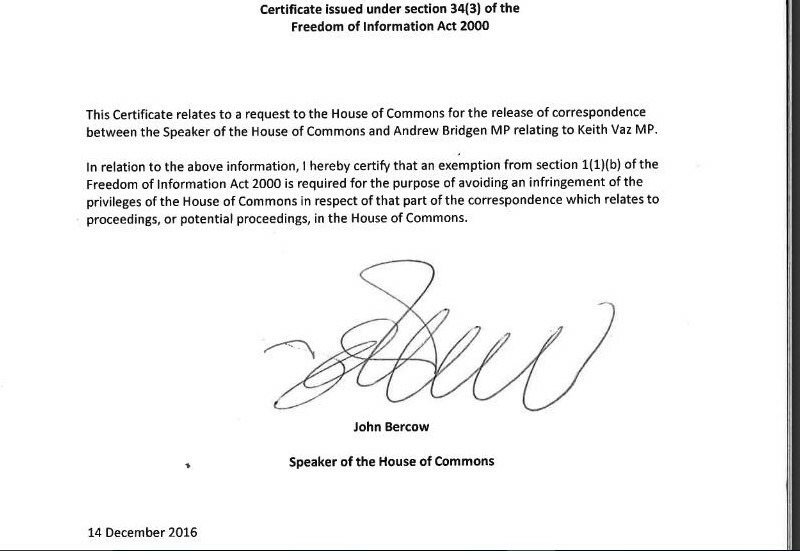 The person who eventually refused to provide that information under the FOI Act, was none other than …….John Bercow! The circling of the waggons or the arrogance of power? (b)if that is the case, to have that information communicated to him. Some people might think that Bercow had a conflict of interest in refusing a FOI request concerning a letter sent to himself, especially when doing it on behalf of the House of Commons, under Freedom of Information legislation. Should he not have recused himself due to this conflict of interest? Some people might think he has a double conflict of interest when that very correspondence is about his old chum Keith Vaz. Is this a concerted campaign by Bercow to protect his chum, Vaz? 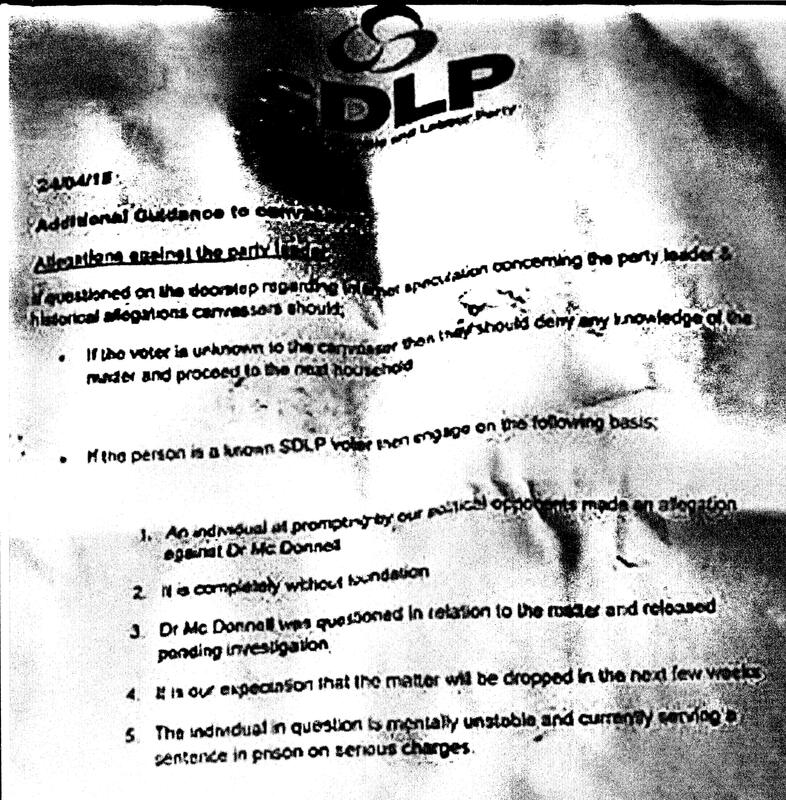 It could be argued that the refusal of the FOI request is indeed the correct response. That has some validity. However for a speaker to decide such a matter when so obviously conflicted, exposes the system as absurdly unfair, not fit for purpose, bringing the House of Commons into disrepute and against their own rules. Justice is not being seen to be done in the supposed home of our democracy. John Bercow is hopelessly conflicted and should recuse himself and be subjected to an investigation as to why he did not. Bercow, acted as one man band defending Vaz, and ensured that not one word of the letter was released, nor that anyone scrutinised his previous decisions. Is it morally and ethically and legally correct for Bercow to invoke Parliamentary Privilege in his role of Speaker, to suppress a letter to him about his friend? Just the week before the certificate signed by Bercow was released, Vaz himself was smarmily joking away in the House of Commons, with his old chum Bercow about Bercows 14th wedding anniversary, to Mrs Bercow, the “innocent face” Lord McAlpine patsy. They are literally laughing in the face of the public. They are supposed to be accountable to the public. Vaz was no doubt buoyed up by the recent decision by Police that he was not to be prosecuted over more nefarious activities with prostitutes and drugs, revealed on video. That dubious activity was enough to make him step down from the chair of Public Affairs Committee, but not enough to prevent him seeking a place on the Justice Committee – all the while with a police investigation into child abuse allegations. The House of Commons is something of a sick joke to us non psychopaths. One of Janner’s friends at the time was Keith Vaz. I am not sure how developed Vaz’s alter ego, Jim the industrial washing machine salesman, was at the time. A previous FOI request to the House of Commons – VAZ, standards of behaviour, Home Affairs Select Committee, Security Committee  established some facts about what standards were expected of MPs. Q. What are the normal guidelines/rules/procedures for a MP continuing in a role such as head of a select committee or on a Security Strategy Joint Committee, when there is clear conflict of interest, e.g. the MP is being investigated by the police for child sexual abuse and his select committee duties cover accountability of the police and overseeing IICSA, or the individual is an obvious blackmail risk on a security committee? No vetting is undertaken for Members or officials serving on Committees. an MP or on any other occasions? If so what type of occasions? What is obvious is that the rules and guidelines are weak and need to be strengthened to deal with the criminals and psychopaths that hide behind supposedly gentlemanly procedures in the House of Commons. However even with the rather inadequate rules, then it appears clear that both Mr Vaz and Mr Bercow have broken Section 10 of the Code of Conduct. Neither have taken steps to avoid a conflict between the public interest and their private interest. Vaz has clear conflict of interest in joining and continuing to serve on the Justice Committee if he is being investigated by the police for offences. It is clearly in his personal interest to influence people and policy in the very bodies that may be called/are deciding to prosecute him and that he has that he has some examinatory role and influence over in his public role. That is clearly against the public interest. Indded he could already have used his position to affect the outcome of the investigations into him. Why has no parliamentary authority taken steps to stop this? Bercow has a conflict of personal / public interest. He is taking decisions on behalf of the public, judging his own previous decision to be correct as well as in protecting his personal friend yet again from public scrutiny. He should have recused himself from those decisions. Perhaps the deputy speaker should have signed the certificate and made decisions regarding Vaz? Why has no parliamentary authority taken steps to stop this conflcit of interest? Vaz’s conflict of interest in joining the Justice committee and remaining on it? Q. Has Keith Vaz declared any interests or conflicts of interest in joining the Justice committee? Q. Has Bercow registered any conflict of interest in signing a certificate refusing FOI request, on issues that he has already taken decisions on and about his friend Keith Vaz? Q. Which are the authorities which supervise Section 10 if the Code of Conduct? Q. 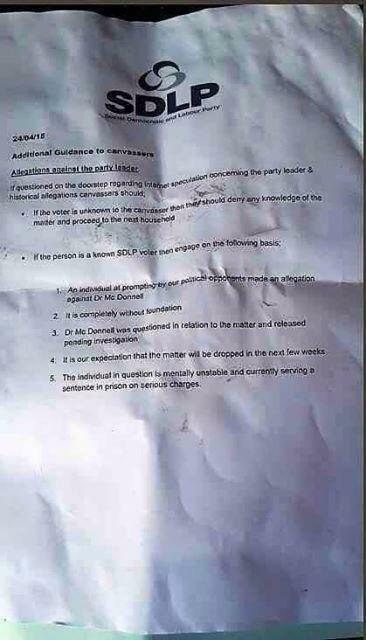 Why have they done nothing about the clear breaking of the Code of Conduct? Q. How many times in this Parliament by which I mean the last general election has a certificate been signed by the speaker to use Parliamentary Privilege as exemption for a FOI request? This entry was posted in #OpDeathEaters, cathy fox blog, Child Abuse, Criminal Cabal of People in Power, Freedom of Information Request, Leicestershire, VIP CSA, VIPs MPs Lords etc, Westminster and tagged cathy fox blog, Child abuse, Child sexual abuse, conflict of interest, Freedom of Information, Greville Janner, House of Commons, Jim, John Bercow, keith vaz, MI5, smarmy, washing machine. Bookmark the permalink. This is really important news Cathy, I have left the Labour Party due to the outrageous acceptance by Labour of Vaz. shout out from Austin Texas! Just wanted to tell you keep up the excellent work!